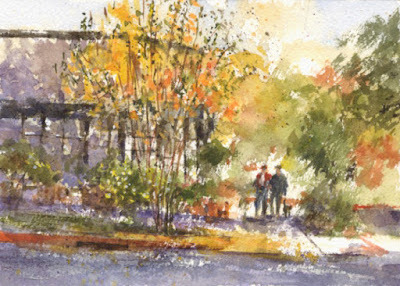 I thought I would post my watercolors from the paint-out locations from the last two Saturdays in 2018. These were both done pretty quickly. I was having trouble finding my subject in South Pasadena when I noticed a pretty tree with yellow leaves and some potted plants by the sidewalk. I didn't have too much time to paint by then so it was done quickly. And last Saturday we were at a park in Sierra Madre. I was late arriving and it was cold. The wonderful trees and bright green lawn looked fun to paint. Unfortunately, it was pretty cold to be sitting for an hour or so to paint. Another "quickie". Hoping to improve my painting and of course paint more in 2019! A community garden in one corner of the park...next time! 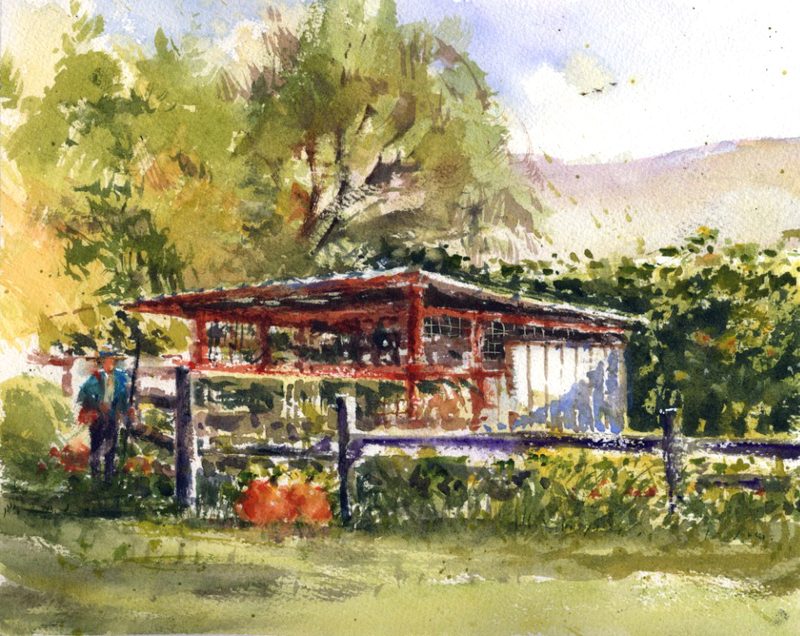 I was happy to paint at our local Arroyo Seco Stables again recently. It's been awhile since my previous paint-out there, Another Fun Challenge. There are many options for subjects to paint at this location. 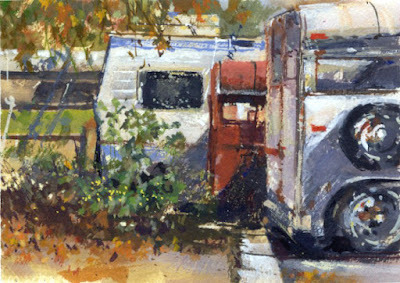 Not sure why I ended up painting the backs of some horse trailers. No possible problems like trash and ants this time. The view had lots of exciting textures and colors so I gave it a try in gouache. After several fall, autumn posts, I should add a watercolor from my most recent visit to our local Arboretum. 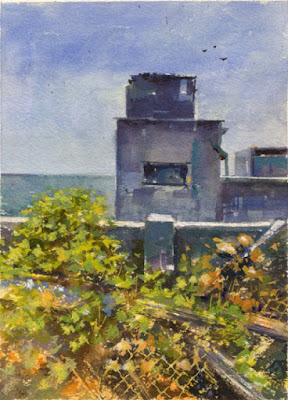 I painted this piece in September after the paint-out group's planning meeting. 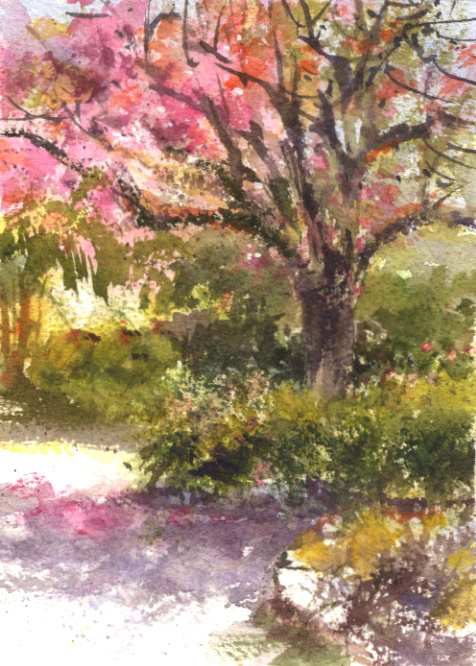 I think trees with large flowers are so unusual as well as appealing. I was surprised to see this tree with big pink flowers in late summer when it seemed fall would be coming soon. I think this tree is a Tabebuia impetiginosa. It was fun to paint for sure. 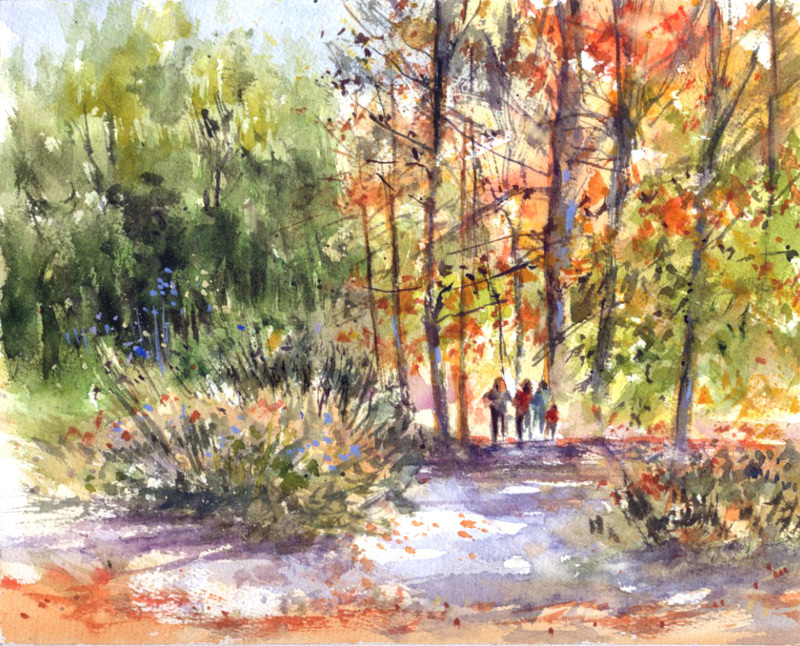 I've been to our local Arboretum a few times since my last blog post painting from there, Trumpets and Fire Sticks. On these visits I did a relatively quick painting following a paint-out group's planning meeting. For this piece I visited one of the display gardens where there are ideas for our own back yards. It's a lovely area and of course the resident peacocks were entertaining as always. 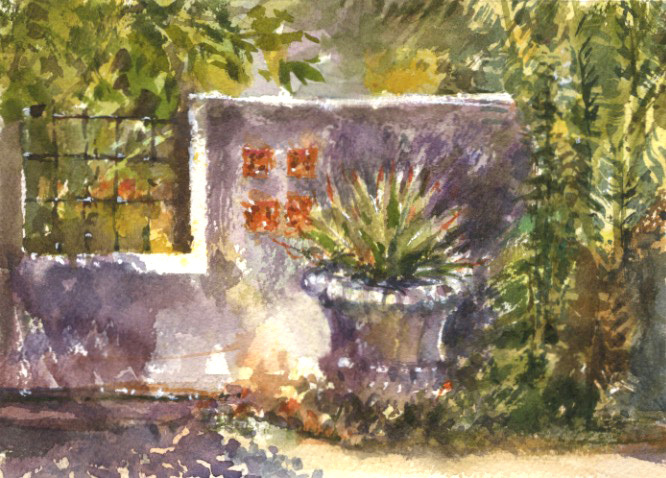 As mentioned in my previous blog post I returned to Arlington Garden for another paint-out. I was very surprised to see how much the leaves had changed colors in just a few weeks. The trees surrounding one of the Garden's main terraces had been green. In fact I've only seen green leaves on these trees. But today it was a little shocking to see the changes in the leaves on the whole ring of trees. 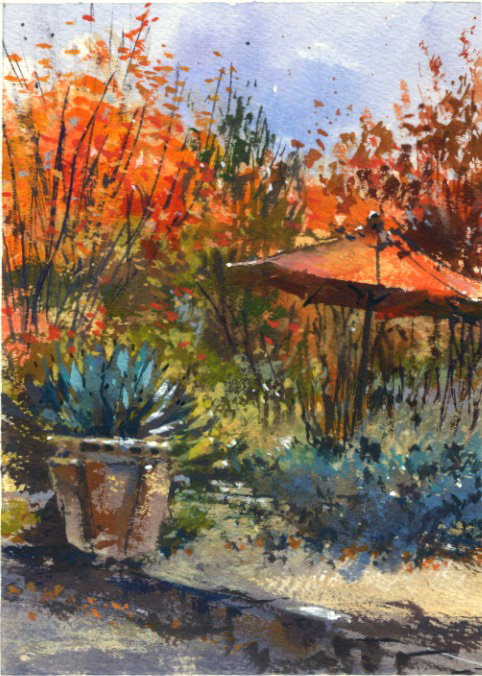 The leaves had suddenly and beautifully turned to bright fall reds, oranges and yellows. Beautiful! On a recent visit to favorite Arlington Garden in Pasadena there was a fall feeling although not many autumn leaves. Our temperatures haven't been very cold yet. Since it was a lovely, sunny morning, there were many photographers with their clients. From the photoshoots I saw it looked like all were children with the photographers trying to get some posed and candid shots. I thought it was so busy with families possibly for Christmas card photos. As always it was fun painting with friends and I'm looking forward to another visit this week. I was very lucky last month to be able to join a paint-out at Autumn Leaf Farm in Monrovia, CA. It was created by a family that designs and builds floats for the annual Tournament of Roses Parade. From my visit it was obvious that their main focus is autumn, Halloween, pumpkins, and everything to do with the season. And, wow, for such a small property in a regular neighborhood, an autumn wonderland was created. I was amazed by the animals and fall season plants, pumpkins and corn. 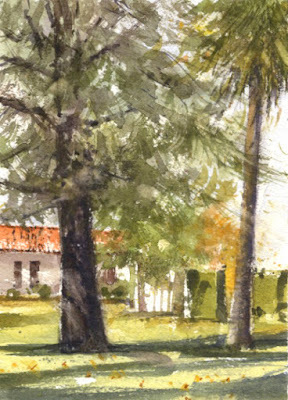 Of course it was hard to decide what to paint, and I'm looking forward to another visit sometime. 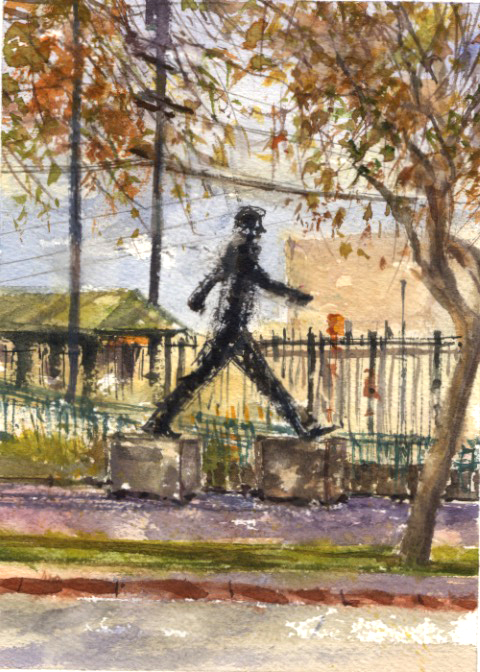 Wow, it was last January when I painted the Walking Man at the South Pasadena Metro station. I'm way behind with my blog posts! 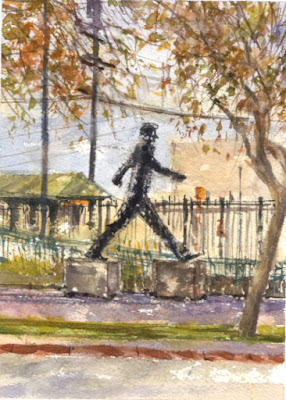 A wonderful feature at our Gold Line Mission Station is the 10-foot bronze strip statue. This neat public art is by Michael Stutz, which he titled "Astride-Aside". It was placed there in 2003 and has been decorated casually by people for special days and events. I'm happy to have this piece in South Pasadena. 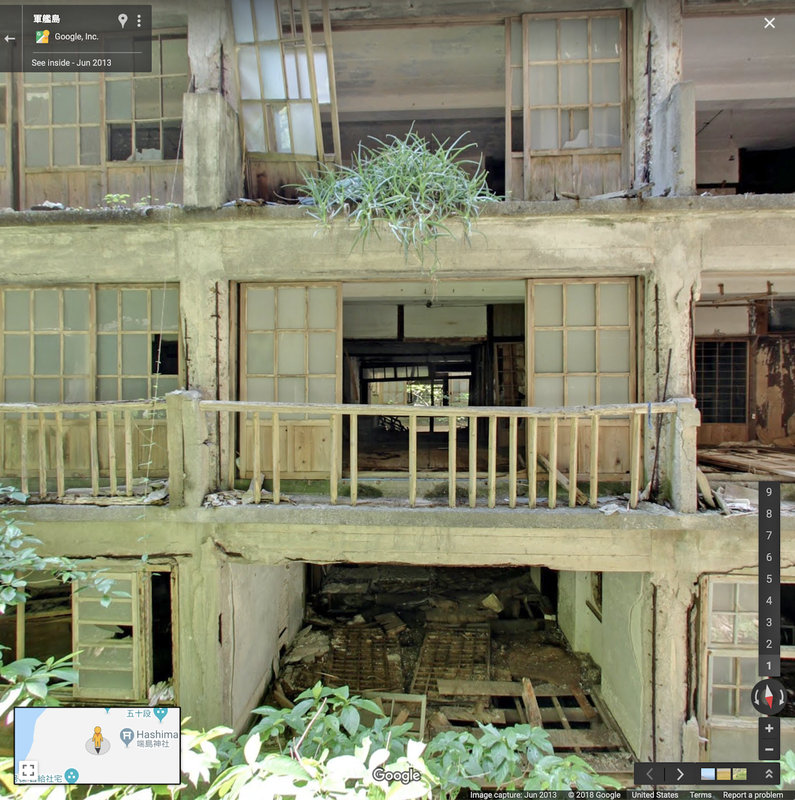 Virtual Paintout - Hashima Island, Japan! The Virtual Paintout for October 2018 was Hashima Island, Japan. 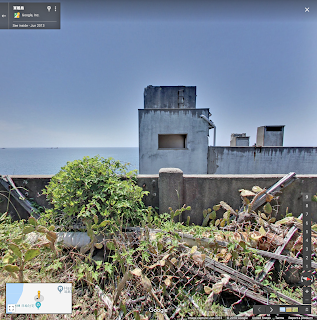 Hashima is an abandoned island off the coast of southern Japan. The 16 acre island was known for its undersea coal mines established in 1887. By 1974 the coal mines were nearing depletion so the mines were closed and the 5,000 residents left the island. In the early 2000s there was renewed interest in the undisturbed historic ruins. The abandoned concrete buildings gradually became a tourist attraction, and in 2015 the island became an UNESCO World Heritage Site. 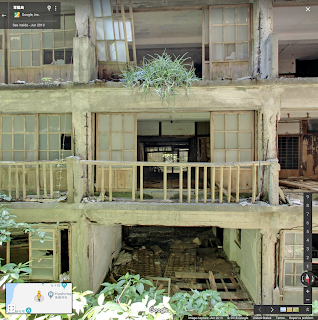 In 2013 a Google employee with a Street View backpack went there to capture the place which allows people to virtually walk across the island and go inside the abandoned buildings where items still remain just as they were left. Such an interesting place. 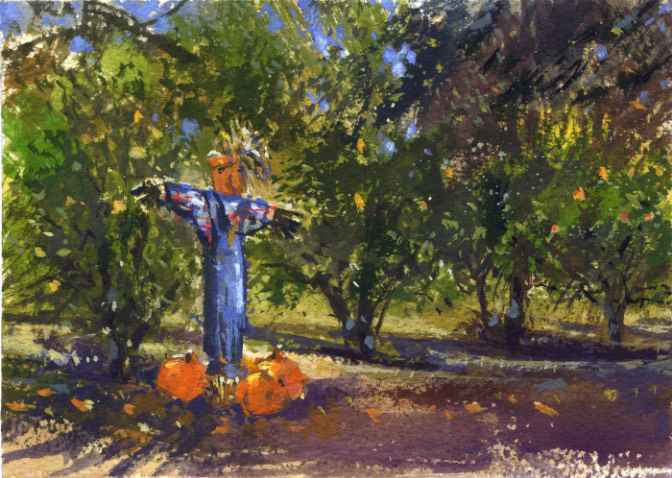 I was happy to see a scarecrow in the orchard when we painted at the Waldo Ward Ranch in Sierra Madre. And some pumpkins as well. There is also a persimmon tree which had some pretty fall colored leaves. At least I think it's a persimmon tree but I haven't seen its fruit. It was fun to find a painting subject that felt like the end of October fall season. Lots of old rusty farm equipment at the ranch.